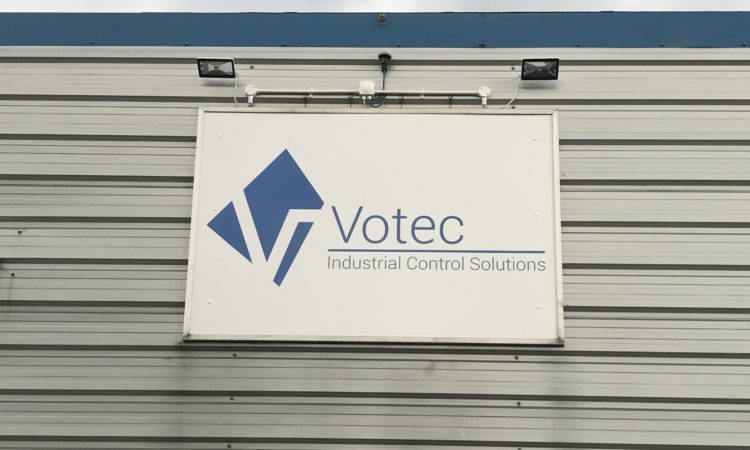 September saw the unveiling of the new Votec sign on the front of our premises in Pembroke Business Centre, Basildon. The sign replaces our old yellow one shown below. Fabricated locally, the new sign proudly displays our updated logo to customers and passers-by alike. Installed ourselves, with the help of a mobile tower promptly supplied by Mark One Hire, we took the opportunity to install some new LED floodlighting to illuminate the sign as well as our car park below. 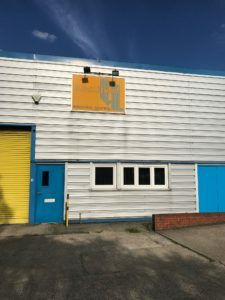 Controlled by our factory PLC control system, installed & programmed in-house, a photocell and separate PIR sensor are used in combination to determine when to turn the lights on. 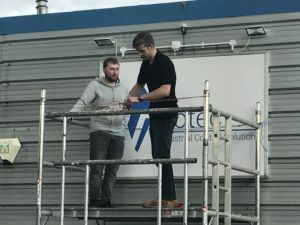 Although in the end no dignitaries were available for the unveiling, our new apprentice Tom was on hand to cut the red ‘ribbon’ (1.5mm tri-rated in this instance) and declare our installation complete.